The Phantom of the Opera has been back at the pipe organ lately and, next week, will drop his first album since the 1920s. Friend and longtime collaborator Mad Organist from one of the haunted mansion in the Black Lagoon's Haunted Mansion Row told Jack-o’-Lantern Radio that he’s already heard the tracks. 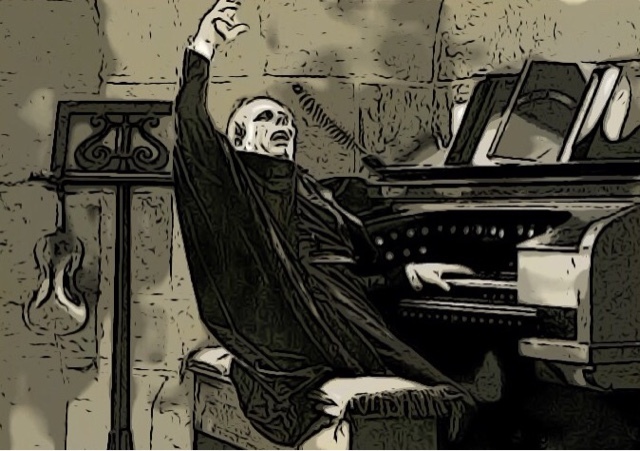 Chillboard Magazine reported that the album, “Straight Outta the Opera House,” would feature The Banshee of South Ireland, the Ghost of Christmas Past and Eminem. Phantom’s previous work sold more than 52 album copies worldwide and his concerts at opera houses everywhere have sold tickets. “Straight Outta the Opera House” is currently available for online pre-orders in the iTunes store. It’s everywhere on Tuesday. Looking forward to getting this album. I plan on pumping this up in my car as I drive down the road.